Between established automakers accelerating their electric vehicle programs and the newcomers in the EV industry – like Apple, Faraday Future or Atieva – engineers with battery experience are not short on employment opportunities. Earlier this year, Apple poached several battery tech experts from A123 Systems and we also reported that about 1 in 8 of Faraday Future’s ~400 employees is formerly from Tesla Motors. From an executive’s standpoint, retaining talent in a specific field can be challenging on its own, but for Elon Musk, CEO of both Tesla and SpaceX, it can be even more complex when both companies he’s managing require talent in the same field… While Tesla is developing an expertise in battery packs for electric vehicles and stationary energy storage units, SpaceX is developing its own high-tech battery packs to power the avionics on its lineup of rockets and spacecrafts. Tesla is known for having popularized the use of thousands of small li-ion battery cells in series to create larger battery packs – an idea the company borrowed from its early partner AC Propulsion. Several former AC Propulsion engineers now work at both Tesla and SpaceX. Even though most, if not all electric cars since the introduction of the Tesla Roadster are now powered by li-ion battery cells, the technology only recently started being used in aerospace. 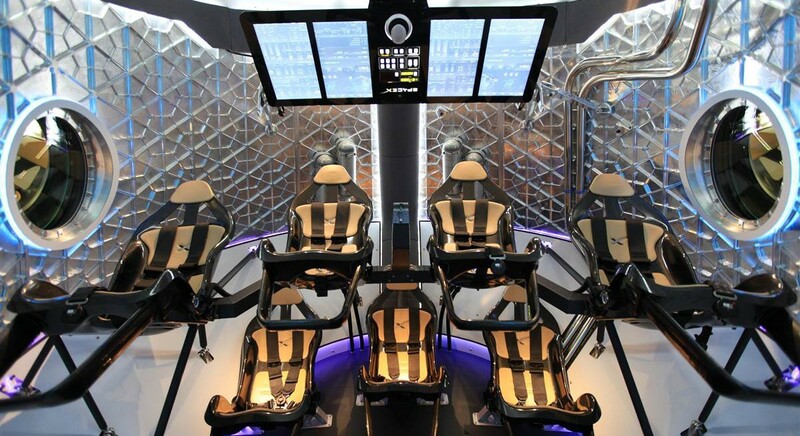 Battery packs on SpaceX’s rockets or spacecrafts need to be able to operate in harsh conditions while remaining reliable, especially for the crew version of the Dragon where the batteries are powering critical equipment for life support and avionics. The aerospace industry long preferred to keep using older and more reliable technologies like Nickel–cadmium batteries, which the International Space Station is still using. Although NASA plans to replace them with li-ion batteries in 2016. Boeing’s 787 battery fire incidents didn’t help the reputation of li-ion cells in the aerospace industry either. At the time, Musk even offered the help of Tesla’s and SpaceX’s battery engineers to fix the problem. He talked with Boeing’s chief 787 engineer Mike Sinnett and confirmed that SpaceX never had an issue with lithium-ion batteries in its spacecrafts – regardless of altitude. Some of the credit for SpaceX’s battery packs performing so well goes to Porter Harris; the company’s former lead engineer responsible for the batteries of the Falcon 9, Cargo Dragon and the upcoming Crew Dragon. Late last year, Harris left SpaceX to join dozens of Tesla engineers at Faraday Future as a Senior Manager for Battery Hardware Engineering. Based on our LinkedIn research, even without Harris, SpaceX’s battery team is still going strong with dozens of experienced engineers. Around the same time Harris left for Faraday, SpaceX hired a senior battery engineer from Atieva, an electric car startup founded by former Tesla Motors Vice-President and board member Bernard Tse. Atieva is being funded by the same company as Faraday Future: China’s LeTV. 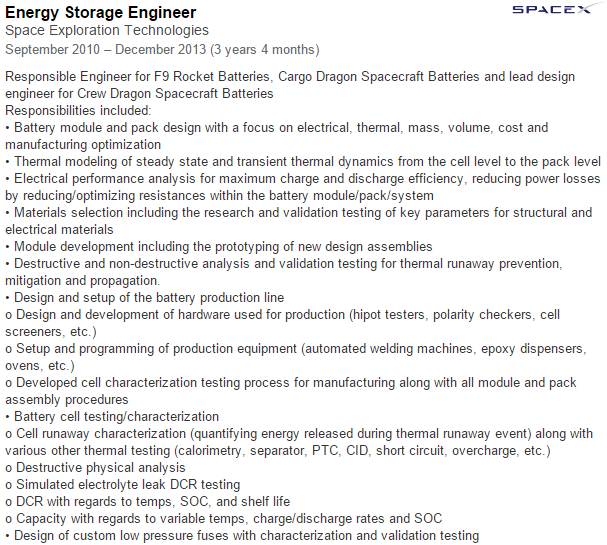 Looking at the movement of employees between Tesla and SpaceX, it doesn’t look like there’s been much transfer of talent in the battery department, but a few structure engineers left Tesla for SpaceX – including the company’s current Lead Structures Engineer. While on the other hand, two former flight software engineers from SpaceX are known to have helped Tesla finally release the Autopilot last month. It wouldn’t be the first instance of collaboration between the two companies. SpaceX transferred some welding technology and equipment to Tesla and there could have been some shared expertise to make the automaker’s Ludicrous battery upgrade possible.